Pretty Little Liars star Shay Mitchell with Biore Acne Clearing Scrub in her green room. Living in NYC ( Brooklyn, to be exact) , we are just always on the move by a force of nature. Work, then out for drinks, or to the gym, then home , then the next day we do it all over again (not necessarily in the same order) ! 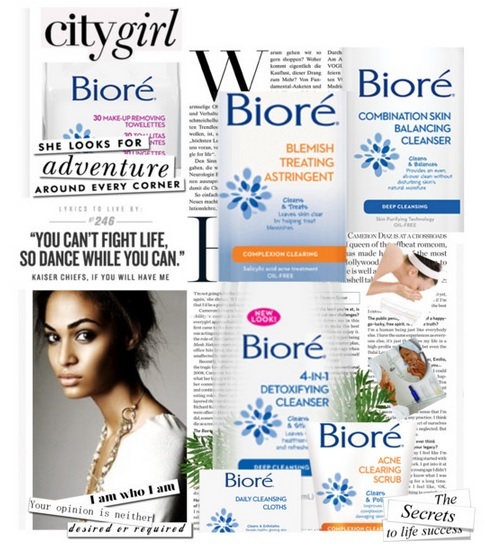 So when it comes to skincare, I am LOVING Biore right now ! The Deep Cleansing as well as Complexion Clearing products. The Daily Cleansing Cloths as well as the Makeup Removing Towelettes are perfect 1. on the go ( ie. after a workout and you want to clean your face at the gym. 2. After a crazy night out - and you just dont have it in you to wash your face, this is easier to get to sometimes then your bathroom 3. Traveling - these are TSA friendly. I like to keep the Daily Cleansing Cloths on hand because you just never know where the day leads you! I have been alternating between the Combination Skin Balancing Cleanser and the 4-in-1 Detoxifying Cleanser following up with the Blemish Treating Astringent . It really is working wonders , and it has not even been a month since I've started this regimen. Since I love spreading the "gift of beauty" .. 5 lucky readers will win the Acne Clearing Scrub. Each Tweet counts as an Contest Entry - so Tweet On! There is no limit to entering! I will contact the Winners on March 22, 2013 , Stay Tuned !! !